THE Royal Free Hospital is bracing itself for the publication of a book by a patient whose 10-day bowel treatment turned into a five-month nightmare and a close brush with death. Colin Ludlow, 53, will reveal the day-to-day frustration of being a patient at the Hampstead hospital in his book, Shadows in Wonderland, released next week. It tells the story of how a tumour in his bowel – initially thought to be piles – was discovered only because his wife, Anna, had been referred to the hospital with a similar complaint. When tests revealed in 2003 that he too had serious bowel problems – a polyp was discovered – Mr Ludlow was later admitted for an operation which he expected would mean a 10-day stay. Instead, he spent months in the Royal Free, reacting badly to drugs, contracting superbug MRSA and having a series of close calls with death. He had six weeks in intensive care and also contracted pneumonia. At one stage, his infected lung needed to be sucked clear, and the misery continued when his gall bladder became inflamed and did not respond to drugs. All this before his 50th birthday and without mentioning the pain of seeing his testicles “swell to the size of grapefruits” during treatment. In his book he describes the difficulties as “medical pinball”. 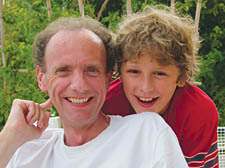 Mr Ludlow said: “Lightning may not strike twice in the same place, but bowel cancer, it appeared, was a different matter. The odds on both Anna and myself contracting it within the space of two years were about as likely as winning the Lottery. Mr Ludlow said he decided to write Shadows in Wonderland to give a patient’s perspective on treatment in a large hospital. Mr Ludlow writes about a series of small incidents that he thinks made life more difficult than it needed to be. Among them are a bust-up with staff who clamped his car when he arrived to pick up his wife while she was having treatment for her own bowel problems. The TV scriptwriter has thanked doctors who treated him. “When you look at the care I received I can’t have complaints about the actual care,” he said. “There are some great consultants. I’m still alive and I’m grateful for that.” He hopes the hospital’s management will take the book in good spirit and respond to some of his criticisms. Mr Ludlow’s troubled stay included a night when he needed a massive transfusion of 45 units of blood. Mr Ludlow, who is due to read from the book at an open-to-all session at St Mark’s Church, in Primrose Hill, on Wednesday, the night before an official launch party, still has appointments at the hospital but his bowel treatment has so far been successful. His wife has had similar positive results. Mr Ludlow said some issues had been addressed since his stay as a patient but warns in the book that “the heroic age of medicine is over”. The Royal Free declined to answer specific issues raised by Mr Ludlow’s book although it is understood a copy was cleared by its lawyers before it went to print. A spokeswoman said: “The Royal Free Hospital has not received a formal complaint from Colin Ludlow and feels it would be inappropriate to comment on extracts from his book.